This week there's been some quilting happening in my creative space. The quilt top that has been languishing for so long - orphaned from batting and backing - was basted for me by some very kind mates. I'm not much good with crawling around on the floor and less so with following rules. So when I heard just how many pins I needed to affix into said quilt, naughty thoughts of shortcuts entered my head. Thankfully I was saved from myself. wow! oh my gosh thats alot of pins! What a lot of pins and what a lot of patience, think I'm in short supply of both! Are you machine or hand stitching? OH WOW!! You have great friends! I don't think I'd have the patience for that many pins so perfectly fixed! Have fun stitching! 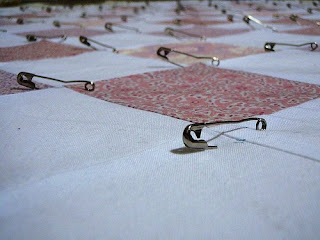 Pins and crawling around on the floor is what made me embrace the commercial machine quilter! I need to get some curved pins like you have though - I'm old-school and always struggle with the normal pins. Very ouchy. Love the quilt! Enjoy the quilting. I am glad they saved it - it is lovely.I hate the basting part - drives me insane and I am always trying to do it with as few pins as possible. Yay for kind friends, can't wait to see it finished. Just lovely, Liesl. Can't wait to see it stitched and bound! I'm very much looking forward to seeing the shortcut quilt job. You will absolutley HATE me for this...but I would be popping a pin in the center of each square too! Very nice - the colour combo's work well - very soothing! Such an amazing process. I think I am starting to feel a quilting itch. 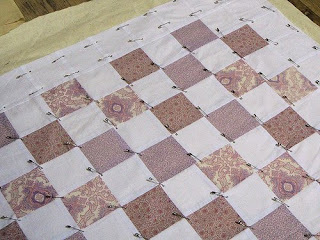 Looking forward to seeing your quilting... it is looking so good so far. Heard on the grapevine it's your bday today, Friday. So, Happy Birthday and have an absolutely wonderful day!!! a little curlypop mentioned it's your birthday today, hugs to you & hope you have a wonderful day Liesl!! HAPPY BIRTHDAY!!! Hope you're having a fabulous day. Hope you are having a fabulous birthday!!! happy birthday ! I hope you are having a great day ! Hi MsHB... I hope you've had a really special 21st birthday :) Hope those boys of yours spoiled you rotten! Happy Birthday Sis! Looking forward to seeing the 'sparkly' outcome of the dior/indigenous print prezzie!!!!!!! I hope you were suitably spoilt! Wow. What great mates you've got to baste your quilt. Looking forward to seeing the progress.